competence cycle | Build Your Walls! Guard Your Gates! As team members learn how to do new tasks, they will go through four predictable stages related to their confidence and competence. The leader’s role is to help them progress through the four stages without damaging their self-confidence or causing too much risk to the team or organization. Stage 1 – Unconscious Incompetence At this stage, the performer has little concept of what the task is actually going to entail. She is incredibly excited about it and feels enormous confidence that she is up to the task. The problem is that this confidence is rarely based on reality. The confidence comes from ignorance of the skills, knowledge and hard work necessary to complete the task. Often, performers feel that success in previous endeavors will guarantee success in this one. Sometimes they are right, but most often they are not. The leader should be very specific with a performer at this stage. It’s important to tell her exactly what, when, where and how a task should be done. Make expectations crystal clear, and supervise progress closely. Think about the last time you took up a new sport. I’ll use golf as an example. You watched it on TV, saw the pros do their thing and thought, “Hey, I can do that! How hard could it be to hit a ball with a stick?” So, you go out to a golf course and mortgage your house to play 18. (You didn’t know it was going to be so expensive!) You head to the first hole and watch the party in front of you. Looks easy enough. Your turn. You set your tee, work a little bit to get the ball to balance on top of it, and then you take a swing! You strain your eyes to see your first hole-in-one. Wow! Those balls are really hard to see…oh… wait. No, they’re not. They show up nicely against the green color of the grass. You take another swing… and another… and another… This is getting embarrassing. The party behind you is starting to laugh… and then complain. Now they are getting hostile. You’ve just entered… Stage 2 – Conscious Incompetence This stage is typically a huge letdown for performers. The high expectations they had have not materialized. The task is harder, bigger, less glamorous, more work, more expensive…you name it. They’ve made a big step, though. Just recognizing that they don’t have the skill set or knowledge for the task is the first step toward getting them. Now they know what they don’t know. As long as the performer doesn’t regress to Stage 1 (i.e., go into denial about the skills and knowledge they need), you’ve got them right where you want them. Now that they know they won’t be the next prodigy, they will typically be much more teachable. What they need from you is encouragement. Their confidence has been dealt a blow, and they need to know that this is a normal stage…that all experts were once beginners. Keep the end result in front of them to motivate them through this stage. Now that you know you aren’t Tiger Woods, you have a few choices. You can give up – golf must be a hereditary skill that you didn’t get in your gene pool. Or you can keep plugging (divots, that is). Get a coach, head to the driving range, practice, practice, practice… With time, instruction and practice, you’ll reach… Stage 3 – Conscious Competence Progress has been made. The performer has developed the competence to be able to perform the task. The problem here is that the performer has to really concentrate on the steps to get it done. He will typically be hesitant and afraid of making mistakes. He might over-think the process, leading to avoidable errors and frustration. Your role as the leader will be to be patient and allow him plenty of practice. He may need a pep talk from time to time to remind him of how far he has come. If the performer starts making too many mistakes in a row, his confidence could be seriously damaged. If you start to see signs of demoralization, give him a break so that he can get his mind off all the steps. When he relaxes, he will perform better. You are now a golfer, but you’re not enjoying it much. It takes too much thinking. Eyes on the ball, legs apart, knees bent, eyes on the ball, pull back, eyes on the ball, elbow straight, eyes on the ball, swing, eyes on the ball, WHACK! You thought golf was supposed to be fun. Be patient. Before you know it, you will cross over to… Stage 4 – Unconscious Competence Eureka! You’ll rarely recognize the transition from Stage 3 to Stage 4 when it happens, but you’ll be able to see it in retrospect. One day, you’ll observe the performer, and she will be performing the task without even thinking about it. Be sure to point it out to her, because she will probably be the last to know. The beauty of this stage is that the new skills and knowledge have been integrated into the performer’s skill set. She is now the expert that she originally set out to be! When did it happen? Who knows? Overnight, you stopped having to think so much about what you were doing. Now, you can’t wait to get on the greens. Everybody wants you to join their group for the upcoming tournament. Tiger called and asked you for some advice. 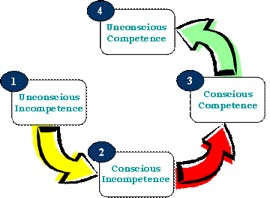 The Competence Cycle is universal. All experts were once beginners – even the Tiger Woods of the world. While some have natural ability, disciplining it to make it work for them is still a learning process. Use the Competence Cycle to diagnose your performers. Then, meet them where they are at to help them move to the next level.